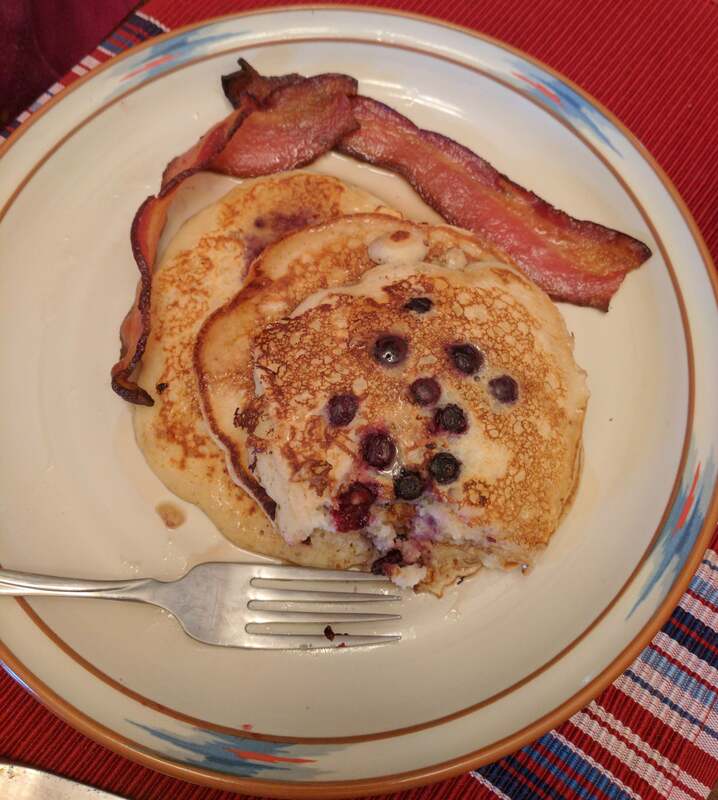 This is a quick recipe for buttermilk pancakes that is as easy as using a box mix and it includes Michelle’s favorite add in – blueberries. This recipe makes 6 to 8 pancakes, perfect for a meal for two. I started by using the powdered, dry buttermilk to make a cup of buttermilk for the recipe. To make sure it had that tang you get from real buttermilk, I added a little sour cream. Warm a pancake griddle over medium low heat while preparing the batter. Preheat oven to 200 degrees F, to have a place to stash cooked pancakes while cooking the next batch. Stir together flour, sugar, baking powder, baking soda and salt in a large mixing bowl. In another bowl, whisk together the buttermilk, egg, sour cream and 2 tablespoons of melted butter. Add the liquid ingredients to the dry and gently stir until all the streaks of flour are incorporated. The batter will still be lumpy. Brush a little bit of the additional melted butter on pancake griddle in the area where you will put batter. Using a ladle, pour out about 1/4 cup of batter over the butter. Sprinkle on a small handful of blueberries. Cook until the edges of the pancake are set, the top bubbles begin to break and the underside is golden brown. Flip over and cook the other side until it is golden brown. Serve pancakes immediately or place them in the prepared oven. Using more melted butter, prepare the griddle for the next set of pancakes. Continue until all the batter is used up.